Show them what you love: EIGHT. Baked Potato with Butter and Mozzarella and Cheddar Cheese! EIGHT. Baked Potato with Butter and Mozzarella and Cheddar Cheese! Another simple sinful snack to much on! All you need is just..
Firstly, boil the potato for 15 minutes. 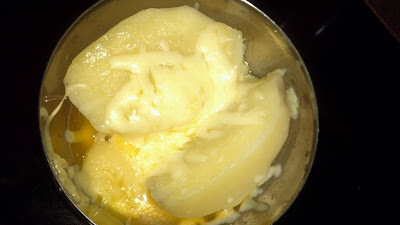 Once that is done, cut the potato in half and put in the butter, either 1 tablespoon or more or less, which will melt later eventually. Sprinkle the cheeses! More cheese means more delicious! Put it in the microwave for 30 seconds. I do hope you like it. Originally inspired by Wendy's baked potato!